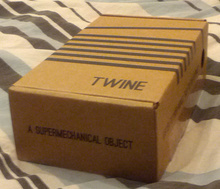 Last year (I think for my birthday) Sarah backed the Twine project on Kickstarter. Well, to say the project experienced some delays would be a bit of an understatement, but in yesterday's mail, it finally arrived. I'm planning on using it to replace the cat water bowl sensor that never got reinstated when we moved house.